Or at least back to center of the cake of yarn. 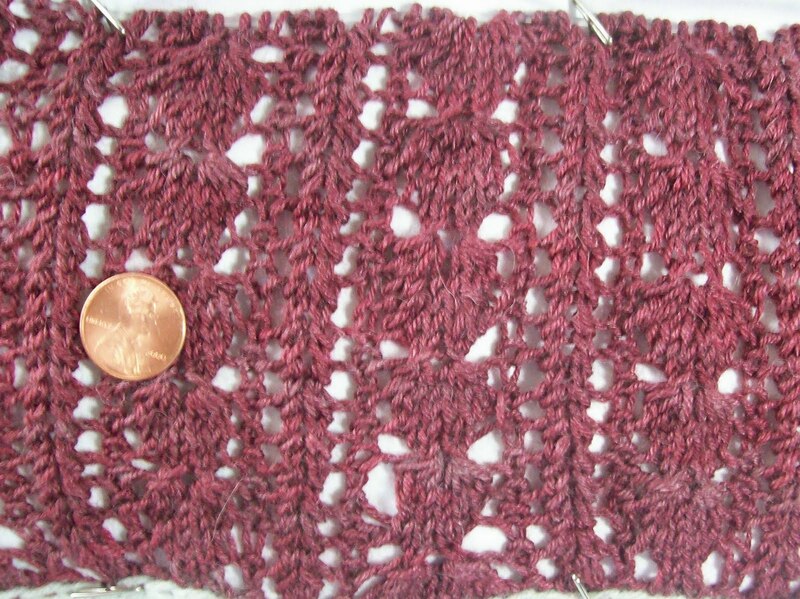 When I frogged the shawl, I just loosely wrapped the yarn around the ball. And I've been knitting with this outer wrapped yarn. Last night, I used up the last wrap, and now the yarn is once again coming from the center of the soft cushy cake. About 4 inches once again— pinned out and stretched--looking as it will once it has been blocked, the ribs are hardly noticable. The plain rib spacer is narrower, and the berry motif is more prominent—and this is better. It's better (less rib like) too, just as it is on the needles. 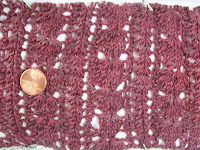 The stitch pattern is fine, (see it with proverbial coin for scale)I am knitting on a size 2 (2.75mm) needle. And while I like the yarn, and the stitch pattern and I am likely to grow bored of this scarf all too soon. This month socks are going to be a pretty simple pair—(well there will be some fun details, but not hard ones) and I can always work on both at the same time to keep interest up.